The Shrine is open to the public throughout the year 24 hours per day, 7 days per week. You are always welcomed to visit the Shrine to pray, especially the Holy Rosary. According to Joseph Vitolo the Blessed Mother appeared to him on October 29th 1945. The glass-enclosed statue of Mary, elevated on a stone platform, is set exactly in the spot where the alleged vision occurred. Our Lady requested that the Rosary be prayed every day for Peace in the World. 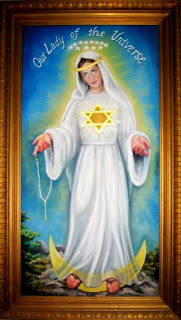 This Shrine is dedicated to Our Lady of the Universe for peace throughout the world.